We’re in Shanghai for the 2015 Shanghai motor show, and since this part of China is seven hours ahead of the UK, the first press day has just drawn to a close. It’s been interesting, as you’d expect – but not necessarily in the ways you’d expect. 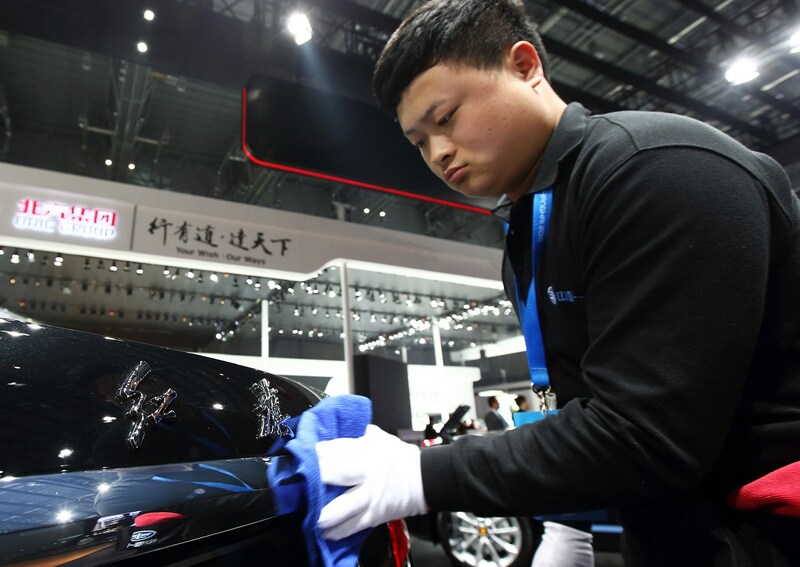 Here are 15 things we’ve learned that serve to sum up the 16th edition of this biannual Chinese auto fest. The show has relocated to a newly built exhibition centre this year, and is spread across eight halls – five of which have two floors. If you didn’t already know China was the world’s largest car market, it wouldn’t take you too long to guess. Send Ibuprofen and sticking plasters. Volkswagen has been in China longer than any other carmaker – in fact, it’s been selling cars here in cooperation with local partners for over three decades, and publically refers to the People’s Republic as ‘Our second home market.’ The VW Group, chiefly meaning Volkswagen, Audi and Skoda working with China’s SAIC and FAW in this context, claims to be region’s largest carmaker, building 3.5 million cars ‘locally’ (as it’s put) in 2014, and selling them through over 1500 dealerships. In 2015 it will introduce 60 new models and derivatives, including at least 15 different locally produced vehicles with electric drivetrain components; by 2019 it expects to have employed another 30,000 people and invested €22 billion. That's £16bn. Er, wow. Urban air quality is a serious issue in China at present – and judging by the smog in Shanghai, will be for some time to come. Carmakers foreign and domestic are hoping to help tackle this by introducing ever-increasing numbers of plug-in hybrid electric vehicles. And if you’ve been wondering why the electric range of these things is nearly always 50km (31 miles), Bentley’s engineering chief Rolf Frech told us that this is the minimum distance mandated by Chinese regulations… Already the East is influencing the West. We’re not just talking about BMW, Audi and Mercedes. McLaren has launched a new, lower-powered variant of its Sports Series called the 540C in Shanghai; Aston Martin, Bentley and Rolls-Royce are all here in force; W Motors – of mythical $3.4 million Lykan Hypersport fame – have a stand (with a genuine engineering prototype on it! ), as does Danish hypercar builder Zenvo; you can hardly move for German tuning companies; and the Tesla stand was absolutely rammed every time we walked by. Meet the iGS – the autonomous version of the MG GS SUV/crossover. Very impressive, even if the sensor array on the roof seems suspicious sleek compared to the whirling radar dish present in the demo video. There are some glaring exceptions to this rule – Landwind, everybody is looking at you – but for the most part the home-grown Chinese vehicles don’t generally look like they’re actively violating any intellectual property rights regulations you might care to mention. 9) Is Qoros the only Chinese car company doing original design? The downside to the above is that the Chinese domestic car selection appears to have largely morphed into some kind of homogenous mass, with very little in the way of outstanding design. The possible exception to this is – the admittedly heavily Europeanised – Qoros, which showed this strangely attractive Qoros 2 PHEV concept. Strong candidate for star of the show is the Citroen Aircross concept, which is what the C4 Cactus would grow up to be if it developed an unhealthy fascination with Arnold Schwarzenegger films during childhood. Spectacular inside and out, expect to see its influence in Citroen’s forthcoming Qashqai rival. Great concept car features include the sliding screen on the dashboard (such a good idea, made potentially possible by the Cactus’s roof-mounted airbag) and that awesome upholstery. 11) Has Mercedes cracked the SUV-coupe formula already? We’ve already mentioned the importance of being driven in China; one of the practical repercussions of this is that interior designers have started to increase the amount of attention they lavish on the rear seat area of cars. The most extreme example yet is arguable the Volvo XC90 Excellence Lounge by Sweden concept. And breathe. The Excellence is a super-lux four-seater version of the XC90 that’s actually headed for production (albeit not for sale in the UK, boo); the additional Lounge by Sweden mouthful reduces the chair count to three. Check out the legroom – and that screen. Really want to get that back seat party started? Then you don’t want a car, or even an SUV: you want a van. One that’s been turned into the automotive equivalent of a low-rent Russian oligarch’s floating gin palace. These things – and of the multiple stands showing multiple examples, most of them were Mercs; forget the Vito and go for a Sprinter – are amazing, with wall-to-wall leather, drinks cabinets and ginormous flatscreens. This extraordinary exhibit has been designed to draw attention to China’s lack of child seat regulations. It’s beautiful and tragic, all at once. That there would be ‘e-tron’. Yes, as in Audi e-tron. Astonishingly, Audi China is using a bloke in a robot suit to draw attention to its plug-in hybrid electric vehicles (including the soon-to-launch A6L e-tron and regional specific Q7 e-tron with 2.0-litre turbo petrol, electric motor and Quattro combination). Audi AG chairman Prof. Rupert Stadler seemed entirely unfazed; tech boss Dr. Ulrich Hackenberg appeared more than especially keen to get off the stage. But perhaps we were imagining it.